On their turn, a player rolls the 7 special dice in a way similar to Yahtzee as a player can use 2 re-rolls to re-roll as many or as few dice as they wish (apart from dragon results which are instantly locked). When the player stops rolling, they record how many of the 6 different results they scored. The round ends when all players have had a turn and each of the different results is evaluated. The players with the most of each result get a benefit. For example, the player with the most defence results is immune to damage, the players with second most defence results heals 1 damage, and anyone else with defence results gets nothing. As well as defence, the different results also deal with finding treasure, looting other players, attacking the dragon, running, and being attacked by the dragon (you don’t want this final type of result). Running is an important element. Those nearest the dragon are usually (but not always) most likely to get attacked by the dragon so getting away from the dragon is good, plus moving towards the exit gives a player a bonus like a free treasure. 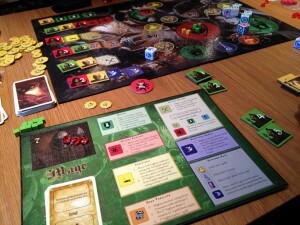 As well as allocating dice (which I’ll describe more in a moment), there are lots of smaller decisions to make too such as using cards to alter actions and using treasures to boost your abilities. The winner is the player who has the most victory points (VPs) as the end of the game and game end can be caused in several ways. Most VPs are scored the same no matter what, but some are calculated slightly differently depending on what caused the game to end: if a player reaches the exit, the player who escapes wins outright; if the dragon is slain, the characters nearest the exit gets minus VPs; if a player is slain, players nearest the exit get bonus VPs. So, there’s lots to balance: Head to the exit or not, gain VPs via treasure, gain VPs by injuring the dragon, rob players, gain treasure, etc. Overall, I really enjoyed Dragon Rampage. The clever element is that whilst it is a dice game, the outcome of each round is based on the amounts of each result a player has recorded relative to other players, and not purely the actual amounts of each result. For example, if red player got 5 axes, blue got 2 axes and green got 1 axe – then red gets the 1st benefit, blue gets 2nd benefit and green gets nothing. So, a player can use lots of one result to secure a main benefit but it’s always at the cost of not having many dice with which to try and secure other benefits. This is a great balance and you have the choice of less chance across lots of categories, or focussing to have better chances in only one or two categories. Of course, the dice you roll will determine what’s possible so you need to react to the results too and find a way to make them work for you. Also, players roll and allocate all their dice before the next player does, so the first player in a round has no idea what other players will roll but has the benefit that they will win ties (as ties are broken in player order). Players that go last know exactly what amounts of each result they need but lose ties so often need to work that little bit harder to qualify for benefits. The different game ends make for interesting decisions too. Our game had an exciting end as I was trying to manage running for the exit, trying to block other players from finishing off the dragon so I didn’t get negative VPs (which I had damaged a lot myself before running for the exit) and trying to get another player killed (to try and end the game so I’d score bonus VPs for being near the exit). This sort of choice in a game is always entertaining. Many treasures give you special abilities but I liked how each player (all different characters) have their own set of cards they can use (once earned) which are specific to their character and give various special abilities too – so each player has slightly different options. Player interaction is high due to players allocating their results (as well as occasional stealing). Also, there isn’t much downtime as you’re always watching to see what other players do with their dice (and may have cards you want to play on another player’s turn too). A few of the physical elements of Dragon Rampage could be improved. The dice themselves are a bit tricky to read sometimes. Also, I’m not a fan of lots of text describing rules on game boards (even if, in this case, it’s the player boards and not the main game board) as I prefer icons to communicate these things. However, these are minor items. It’s a little bit more expensive than I would like (I can see how a cheaper, smaller version could be produced) which is the only thing that stopped me buying a copy at Spiel, but it is a game that I definitely want to play again and I expect I will buy a copy of at some point. 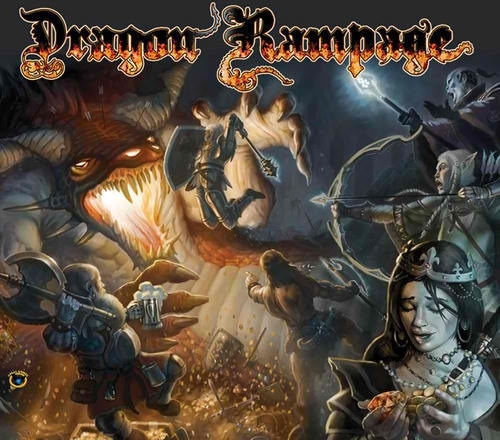 This entry was posted on Friday, November 4th, 2011 at 10:02 am	and is filed under Board Game Review, Board Games, Dragon Rampage, Essen Spiel 11. You can follow any responses to this entry through the RSS 2.0 feed. You can leave a response, or trackback from your own site.